Small space blues are real. What seemed like an economically sane decision quickly turns into an ordeal when you realize that you cannot move around home, without bumping into furniture or your pet or your partner. The fact though, is that any living space can be organized better, no matter how small it is. You only need to think smart rather than get inspired by the latest design fad that you came across on Pinterest. If you are woefully short of ideas, then here are 22 tips that will help you organize your home better and with some luck, drive some of those small space blues away. If only we could have a kitchen that had enough room to store all our pots, pans, bottles, Tupperware, crockery, bins, containers, spatulas, baskets, bins, tongs, et al. See? You never run out of things to store in your kitchen. This secret shelf is ridiculously tempting to make and so functional. It’s sleek enough to hide in the wee bit of space between your refrigerator and the wall. Yet, it can store as many things as a full sized cabinet can. Don’t believe us? Check video above for more previews. This Pull Out Pantry can be a seamless extension to your existing pantry. It’s somewhat similar to the secret shelf design that I shared earlier. However, there’s a lot more room in the horizontal shelving. This can easily accommodate some of the larger containers. A neatly tucked Plexiglas piece serves as the fencing that protects the contents from tumbling out as you pull the shelf. Most importantly, it’s way cheaper than getting a bespoke one made. Floating shelves are so versatile. You can customize them in all sorts of sizes. They can fit into tiny nooks. They serve as landing pads for just about anything you fancy. And they look great. Don’t they? Have some space between the stairs and the wall? This DIY floating shelf from Simply Organized will fit right into it. The lady here uses dark wood stain but I recommend chalk paint instead for a rustic, worn out look. Here’s a great way to put that old, outdated side table to good use. Convert it into a contemporary and sophisticated looking cube table using some mirrored Plexiglas, glue and cardboard. The end result looks so good that it can easily pass off for a designer $1000 side table. God, I love DIY hacks. This desk organizer is a creative solution to the bane of the modern-day home, cluttered work desks. It has enough pockets, hangers and shelves to store most of the tiny nick knacks that otherwise make for an ungainly desk. Not to mention that you can easily find the things that you use the most frequently. Irrespective of whether you wear ties or don’t, you’ve got to love this DIY Tie rack. Distressed old wooden board, a ledge on top and a row of old fashioned 2.5” nails. Bingo! You’ve got an amazing new place to display those ties. By the way, you can get really creative with this and convert this into a key hanger or a decorative fixture. Super easy to make as well. Someone wise once said that a cluttered desk = a cluttered mind. Couldn’t be truer. Organizing your desk improves productivity. The fact that you can find the things that you need the most a lot faster will also reflect on your concentration. This DIY organization block is tailor made for woodworking newbies. It is as simple as tracing a block on paper, cutting out a few blocks of Plywood and gluing them together. The best part is that you can make your own block to organize just about everything from cellphones to keys to office stationary. Make one for your bedroom too and stain or paint to match the existing décor . Spices enliven your food. The irony is that rows after rows of spice bottles often clutter your countertops. This fold down spice rack allows you easy access to your spices and keeps them hidden when they are not in use. It can be made from any old wooden briefcase or trunk, which adds a rustic chic element to your kitchen. Add a few of these in varying sizes around home and you have a smart storage solution that’s as aesthetic as they come. Storage and organization is about sprucing up existing décor or furniture pieces and improving their functionality. This DIY hack allows you to convert any wall art into a folding murphy table that can be used for a variety of tasks. When not in use, it looks as innocuous as any wall art would. Some heavy duty hinges, wood glue and paint is all that it takes. It can serve as a temporary work desk. Add a mirror on the wall next to it and you have a folding makeup desk. Nifty! This console table adds layers of functionality to just about any room that you place it in. Place it between the bed (if it does not have a headboard) and the wall and you have a place to park your reading lights, books, and décor. Place it in the game room and you can keep your drinks or game titles on it. Stain it, paint it, add some hidden LED light strips to create a cool ambient light effect. It’s sleek, compact and easy to make if you know some basic woodworks. A couple of hours job at best. 12. LIFT TOP COFFEE TABLE W/ HIDDEN DRAWER. This lift top coffee table with a hidden storage drawer is one of our favorite, multifunctional furniture pieces. It has a hinged top to the table that can be lifted and pulled towards the couch or your favorite lounge chair. And the storage drawer is hidden underneath it. Keep it in the gaming room and you have a place to store your joysticks, cables and PlayStation accessories. Add some caster wheels to the bottom and its portable. Add a wood composite top and you can even cart it outdoors during parties. It might sound like a cumbersome design but this DIY tutorial grabs your hands and takes you through each step in astute detail. Hosting guests can be a real challenge in a small apartment as sleeping space is scarce and most of the times, guests end up cooling their heels on the floor on flimsy mattresses. This folding bed bench is a dream come true for smaller homes. As implied by the name, it’s a combination of a bed and a bench. When not required, the zigzag leg pieces fold away into the dimensions of the main frame instantly converting into a functional bench. It’s easy to fold and unfold that you’d be tempted to have as many of these at home as possible. The sleek dimensions make it a great console table as well. If only we could do away with cables forever. This smart table design almost manages to pull it off by neatly concealing the cables in the legs. More importantly, the cables are protected by a layer of felt, they don’t get tangled and the structural integrity of the table is not compromised. No mean feat, eh? Yet, the design is so practical and easy to make that -I believe- any beginner woodworker can reproduce it at home. If this amazing design of flexible furniture were to go mainstream, then we wouldn’t have space-hogging wooden clunkers in homes anymore. These are minimalistic yet attractive. And they are made from simple wooden frames that can be made in minutes combined with felt pieces that are curved, rotated and glued together. 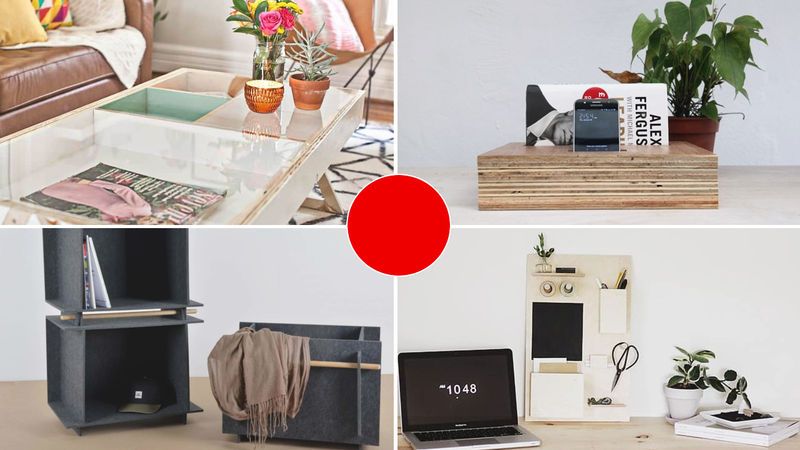 From simple desks to coffee tables to baby cradles, the possibilities are endless. Be it electrical boxes or ungainly cables, some of the visible things around home can be just plain grotesque. Unfortunately, you cannot do away with them. So hide them with these easy to make plywood boxes which can be tailored to look like floating books or shelves. Within a couple of hours, you can completely hide everything that looks out of place at home. Storage compartments in coffee table tops bring out the functionality in an unused aspect of the furniture piece. With this acrylic top, it becomes an aesthetic addition as well. It can very easily become the focal point in your room. You can create geometrical shaped compartments, as many as you want to and store everything from decorative stones to books and keys in it. As complicated as it sounds, the table with the see-through top is very easy to make. I love the mid-century modern staining on it as well. This one is our personal favorite. It’s so simple yet so effective as it uses a universal element of home architecture, corners. This is a creative catch bowl. It divides a hemisphere (half of a sphere) into three quarters and one quarter. The three quarter part fits into the convex corner while the other one fits into a concave corner. The versatility of the shelves allows them to be used to park anything on it. And it looks out of this world. From Torafu Architects, the guys behind the Catch Bowl comes this amazing floating shelf which they call the Clopen Shelf. The Clopen shelf is an incredibly sleek floating shelf that hides a thin storage compartment. Midcentury furniture designs are rad. Aren’t they? Take this simple side table for example. It looks stylish, is compact enough for small spaces and has a hidden storage compartment for remote controls and other small details that tend to be an eyesore. You can make this on a weekend within a few hours and it uses simple things like tapered legs, a cakepan (yes you head this right) and a round wooden circle. I can’t wait to see your own versions that you guys come up with. This dainty little storage compartment remains hidden behind a ubiquitous looking wall coat rack. And because pulling out or opening a hinged compartment with a heavy wet coat on it can be impractical, this one uses sliders instead. Just slide it to the sides to reveal a compartment that can be big enough for your sunglasses or your keys. You can add an unlimited number of shelves to the compartment and make it as long as you want to. If your home has more wall niches than what you can appreciate, then here’s an excellent way to cover them up without resorting to outdated design techniques. This one uses a mirror to cover the niche and the mirror is mounted on sliding rails, flush against the wall which lets you slide it to a side to reveal the storage inside. I would go one step further and add floating shelves to organize the storage. You can even add sleek floating shelves with hidden drawers to amplify the functionality. From mobile phones to keys to calendars, there are tons of things which can be hidden in this niche. Not to mention that the mirror makes your room appear bigger. Pull out drawers on floating shelves are so passé (Psst…I still love them). But here’s an even better hidden floating shelf storage system. This one divides the floating shelf into two parts. The entire outer part is the actual shelf and can be pulled outwards as one unit along with the stuff that’s parked on it. The inner drawer remains hidden and has ample space for some of the bigger stuff that lies around home begging to be organized. All it takes is less than four hours to rig this up. Smart multifunctional furniture fixtures like these free up some much-needed space in small homes without the aesthetics going for a toss. Which ones have you installed or want to install in your home? That’s it my fellow Simphome readers. I hope you enjoyed my countdown through this list. Before you go, share it with anyone close to you in your social media account. And lastly, Until next time, Thanks for watching. !